Bilbao, 27 February 2019 Climate change is a reality that is altering the distribution of species, ecosystems, and sea levels at all corners of the globe. The average global temperature was at its fourth highest last year since records began, and 1oC higher than what was recorded during the pre-industrial era (1850-1900) according to a report by the World Meteorological Organisation. But what impact does this phenomenon have on the future of an important sector for the economy such as the fisheries sector? Research on Basque fisheries, led by the technology centre that specialises in the food value chain and the sea, AZTI, has revealed that climate change could particularly affect eels, while anchovies from the Bay of Biscay would slightly benefit from the changes, being a species that is distributed from tropical to temperate areas. 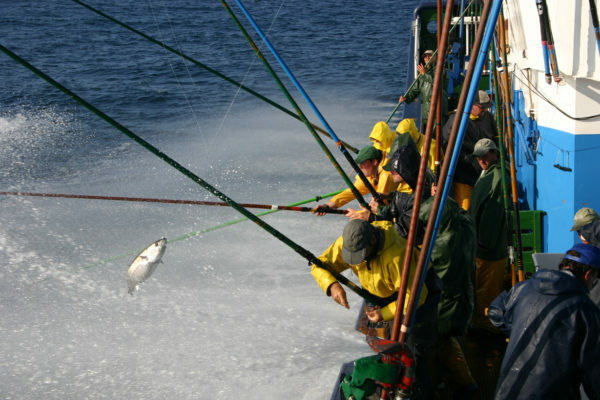 The research brings together a number of projects funded by the Basque Government and the Ministry for Ecological Transition with the aim of understanding the impact that climate change will have on fisheries, as well as the future evolution of stocks, in order to minimise possible economic losses in the fisheries sector. Thus, AZTI researchers have studied the potential impact that climate will have on the abundance, distribution, and spawning of fish, with the aim of offering proposals so that the fisheries sector can adapt to the new situation and manage marine resources with the lowest impact possible. According to the study, a clear example of the effects that climate change will have is on the distribution of mackerel spawning: a displacement of their latitudinal centre by around 16 km per decade towards the north has been detected since 1992. In addition, a recent study by the ICES (International Council for the Exploration of the Sea) which AZTI has participated in on the 21 main commercial species for Europe has detected that the distribution of 16 of them has changed, and the variability in sea temperature is one of the main contributing factors. Studies by the technology centre offer an optimistic diagnosis for anchovies from the Bay of Biscay, as it is predicted that egg production and the spawning area will increase throughout the 21st century. Although anchovies have a short life span and reproduce when they are only 1 year old, according to Chust “the species is adapted to a wide range of temperatures from tropical to temperate zones and its tolerance to sea warming is therefore greater”. The study considers it to be a species that resists this phenomenon and may even benefit in this area, although the competition with other pelagic species or interaction with predators, the abundance of which could also change, could in turn modify this future scenario. The study also revealed that anchovy spawning has moved forward by around 6 days per decade since 1987. Seasonality is an essential factor in the life cycle of many pelagic species, as it determines when spawning occurs or when migration begins, which are induced by factors such as sea temperature and the mixing of different ocean layers. Another example detected by AZTI is the early arrival of albacore in the Bay of Biscay, which occurs around 2 days earlier per decade than at the beginning of the 1980s. The distribution of bluefin tuna, a species with significant thermoregulatory capacity, is expected to expand to waters in the North Atlantic, particularly those of larger specimens. Juveniles, on the other hand, are expected to continue to visit the Bay of Biscay, especially if anchovies are still present. The study also indicates that the distribution of bigeye tuna may be displaced towards the north. This fact could affect the fishing of this species in the tropical zone and possibly move catches from more tropical areas towards the Cantabrian Sea. The change in distribution of bigeye tuna towards the north would be beneficial for purse seine tropical fleet that target skipjack and yellowfin tuna, as bigeye tuna is a by-catch that is hard to avoid. In any case, AZTI researchers warn that “continuous monitoring on the trends is required before any specific measures on these tuna species are taken, and projections must be improved in order to confirm the results and reduce the degree of uncertainty”. With regards to the European eel, which is in a critical condition, the study shows that climate change could add to the severe threats that loom over this species (loss of habitat, unsustainable fishery exploitation and mortality in hydropower plant turbines, among others). Therefore, in light of this potential additional threat, it is recommended that the conservation measures set out in the Environmental Recovery Plan be increased in order to ensure their future survival.